It was just days ago that the upcoming Universal spinoff Fast & Furious Presents: Hobbs & Shaw wrapped production. However, according to star Dwayne "The Rock" Johnson, the film's first trailer is right around the corner. "Get ready for our worldwide [Hobbs & Shaw] trailer debut on FRIDAY," Johnson tweeted. "[Jason Statham,] [Idris Elba] & the kid stir up trouble & fun in the biggest showdown the Fast & Furious franchise has ever seen." Initially, it was reported that the trailer would arrive during February 3's broadcast of the Super Bowl -- a report that was supported by an Instagram post from Johnson himself. Apparently, plans changed, though, which should come as a much welcomed surprise for fans of the Fast & Furious franchise who can't wait for the big game. 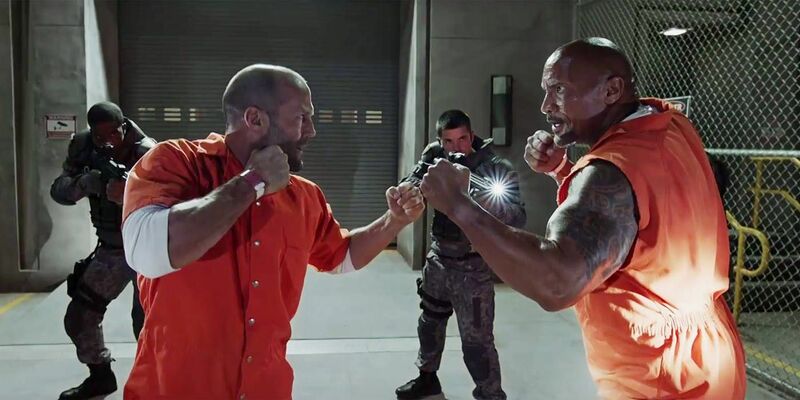 Hobbs & Shaw will be Johnson's final foray into the franchise for the time being. According to the actor, he won't appear in Fast 9, though it remains to be seen if he'll reprise his role for the tenth film. Directed by David Leitch from a script by Chris Morgan, Fast & Furious Presents: Hobbs & Shaw stars Dwayne Johnson, Jason Statham, Idris Elba, Vanessa Kirby, Eiza Gonzalez and Roman Reigns. It is scheduled to be released on August 2.